OK Maldives is an organization specialized in organizing dive cruises in the Maldives. With its experience, it is one of the only companies that offers such a large choice of routes: from the far north to the south. Established in the Maldives since 1983, we have experienced the rapid development of tourism in the Maldives, which has allowed us to evolve over the years in terms of comfort and the course of dive cruises. Today OK Maldives is proud to have been able to give the best of itself to the current changes to offer you the best of the Maldives. Tours are offered on board the Equator, a comfortable Yacht, 30 meters long and 9 meters wide, with big renovations made in 2017, comprising of 9 cabins, including 2 suites, completely managed from A to Z by a local crew of 7 well experienced sailors. The Equator is accompanied by a large dive Dhoni (a traditional fishing boat of the Maldives), where the compressors and all the diving equipment is stored. Thus armed with two boats with specific functions: liveaboard and diving boat, we guarantee a large space for everyone on board, and the feeling of living on a cruise on a manageable scale. Too often common in the world of diving, unpleasant surprises and extra costs often make an appearance and may tarnish your vacation. At OK Maldives we are committed to 100% transparency, everything is clearly stated in the quote. In addition, a minimum package of dives is indicated depending on the duration of your cruise, if you manage to do any additional dives, they will not cost you anything. The two pillars of our philosophy are “Security and Satisfaction”. OK Maldives is committed to putting all its know-how and respects any obligation of means to make sure you spend the best possible vacation. If you’ve ever felt more like a “wallet customer” than a vacationer and a friend, then you are more than welcome to our home. Our small team of professionals sees respect and friendliness as the basis for our activity. Adapt: this word makes sense at OK Maldives! The tours and itineraries are often reviewed during the cruise, and the dive sites are chosen on a day to day basis: we take into account on-site and real time weather conditions, frequency of divers on sites, and especially our instinct to ensure optimal flexibility and aiming to dive in the right place .. and at the right time 🙂 . It will always be possible to dive in autonomy if your level allows you, or to be guided according to your desires: whatever your level OK Maldives instructors are committed to take care of you. In addition, all of our cruises are also open to non-divers and/or snorkelers, who can observe the same species in the best conditions. The only centre opening our doors to rebreather divers! Owners of the OK Maldives company since October 2017, Aurore and Franz are waiting for you on their magnificent cruise ship to make you spend an unforgettable vacation! Initiated to the joys of underwater diving at a young age, Aurore (BEES 1 and PADI Instructor) and Franz (BEES 2 and PADI Instructor) immersed themselves in diving as a passion and a way of life, as well as a profession. They became instructors respectively at the age of 24 and 19, and have never hung up their fins since. After having a few seasons in the south of France, Aurore co-ran a school and dive shop in Lyon, where she became an expert in equipment and lake and quarry diving (brrrrr …) and will continue to practice at the famous Meyzieu dive pit. As for Franz, he has spent time in his early years around the globe, especially in Egypt or the south of France, and sometimes even in Corsica. Finally came the revelation: the day they discovered the Maldives, and fell literally in love with this little terrestrial and aquatic paradise, rich with its underwater inhabitants, big or small, which they never tire of. 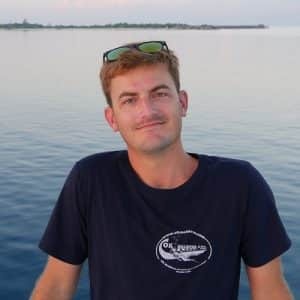 A keen pelagic lover in all its forms (especially sharks) and with years of experience in Maldivian waters, Franz will go above and beyond to find the perfect spot to satisfy his divers. 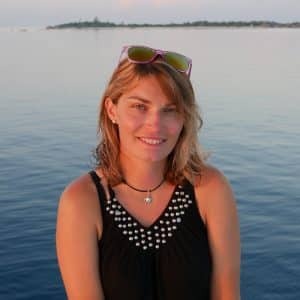 Aurore will be happy to help you discover and share the magical world of the Maldives, bringing her sweetness with a personal touch. Their guilty pleasures? Amongst many others: Haribo Maxi-Dragibus for Aurore, and chrcuterie for Franz (and nothing is definite .. but an extra shark and manta ray may be negotiated for each sausage/chorizo/camembert/foie gras .. brought on board 🙂 . 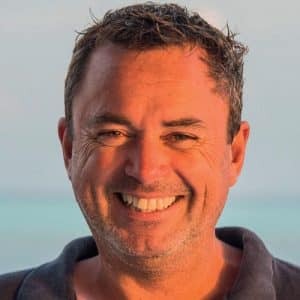 Present in the Maldives since 1990, Christian is one of the precursors of the Maldives dive cruises activity. 2017, after 27 beautiful years of adventure and discovery in the Maldives, he decided to step back and give up his “baby”, as he calls it, to the careful hands of Aurore and Franz. Christian is now your main point of contact for booking your dream dive trip to the Maldives via his newly created travel agency “Tohora”. Christian will be able to help you choose the course that suits you according to your expectations. Questions or special requests, do not hesitate to ask for clear answers. A competent contact to guide you in the preparation of your trip. The entire OK Maldives team is waiting for you and is at your service. Thanks to all those who are faithful, and who continue to trust us season after season.